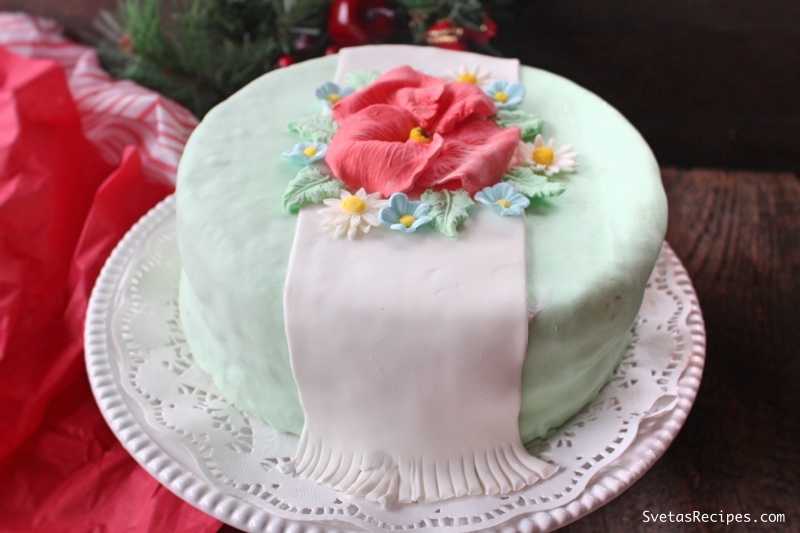 This cake is one of many delicious, Ukrainian cake’s that I make for many occasions. I fell in love with this recipe after the first time that I tried making it. It’s very easy to make and it is beyond delicious. Try it out and I hope you like it as much as I do. 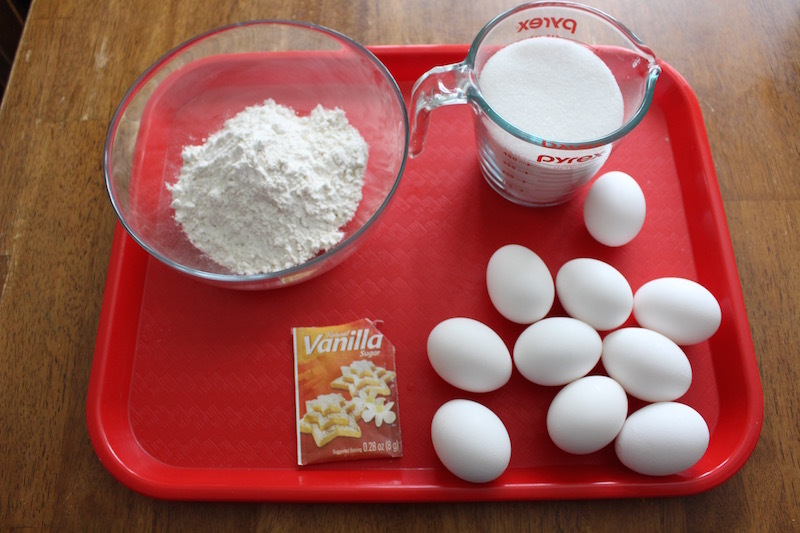 Add eggs and sugar into the mixer bowl and let it mix on medium speed for 20 min. After it mixes, add sifted flour and gently mix with a spatula. Then divide this mixture into two equal amount. 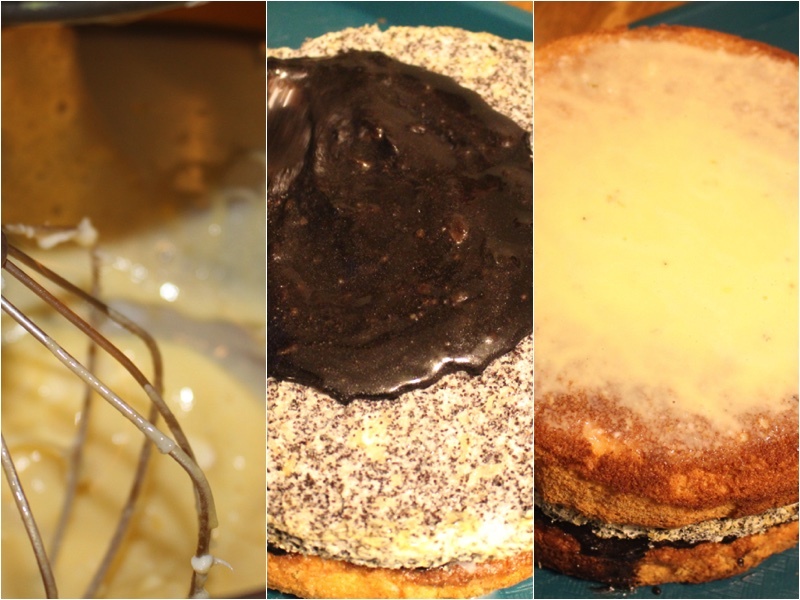 As you see in the picture shown above i added the same amount of cake mixture into each cake form. (make sure to spray the foil inside each cake form with a little bit of oil). Let it bake for 25-30 minutes at 350 F.
Add 6 egg whites and sugar into mixer bowl and mix on medium speed for about 10 minutes. 3. 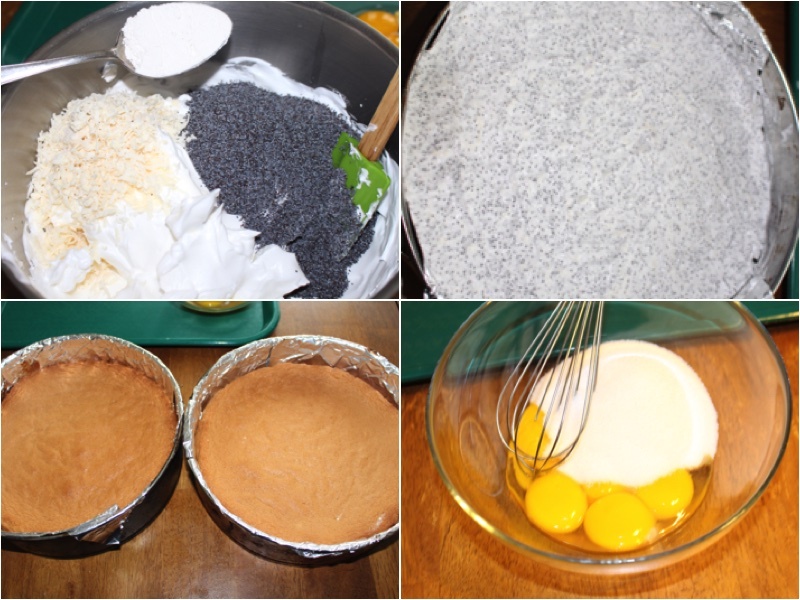 Then add poppy seeds, coconut flakes and 2 tablespoons of flour into the egg whites mixture and mix with a spatula. Let it bake for 30 min at 250 F then lower the temp to 200 F and bake for additional 3 hours. The first two layers of the cake are baked and should be cooling down at this point. In a medium size bowl mix by hand egg yolks with sugar and place on top of the pot (full of boiling water) to bring this mixture to boiling point.Then let it cool down. 4. In another pot add milk/ flour and bring to a boiling point and then let it cool down. 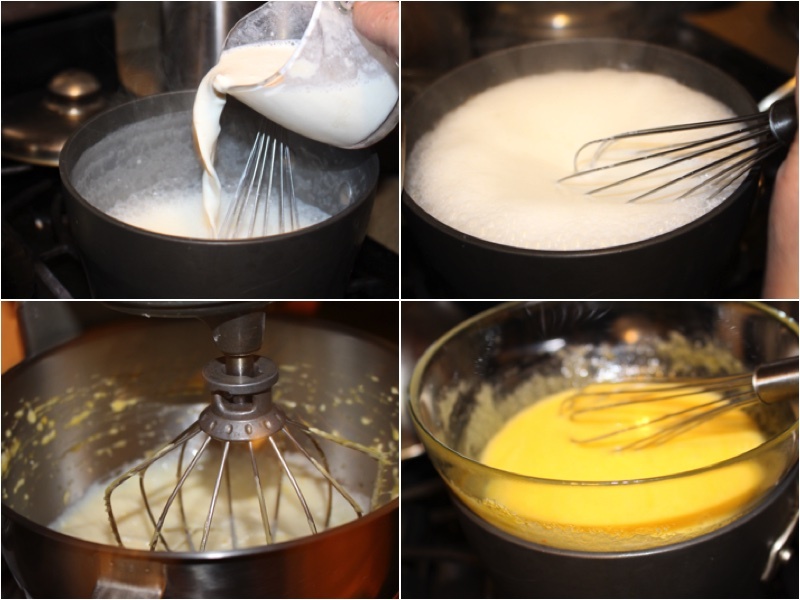 Add the two mixtures into a mixer with room temperature butter and mix for about 5 minutes. 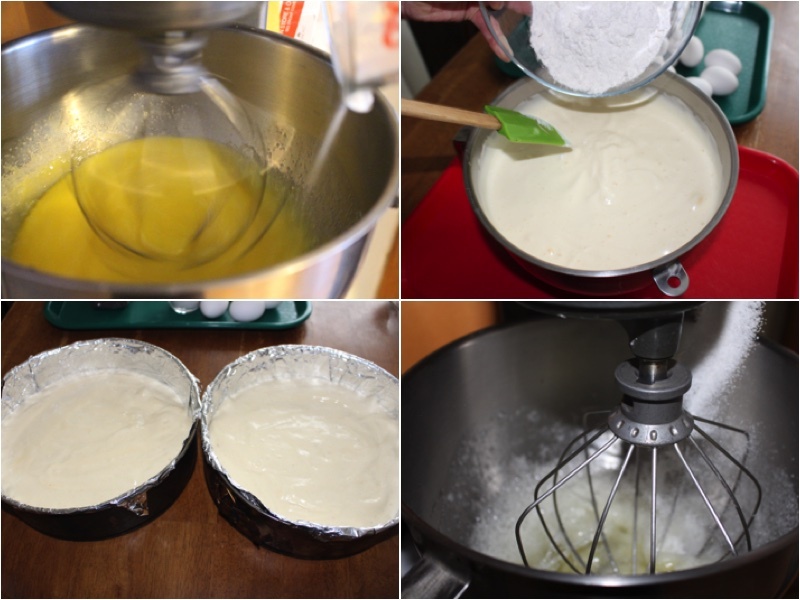 5.Take the first layer of the cake and cover the top with this cream. Then take the meringue layer and cover the bottom and the top with chocolate. Then add the top layer for the cake and cover it with the cake cream and let it dry a little before covering it again with a chocolate layer and covering the sides of the cake with chocolate. Making chocolate to cover the middle layer of the cake/ the top of the cake and the sides. Take 2 sticks of room temp butter and 5 tablespoons of water and bring to boiling point. In a bowl mix 3 tablespoons of cacao and 1 cup of sugar and mix well. Then add it into the pot with the rest of the ingredients and bring to boiling point again. 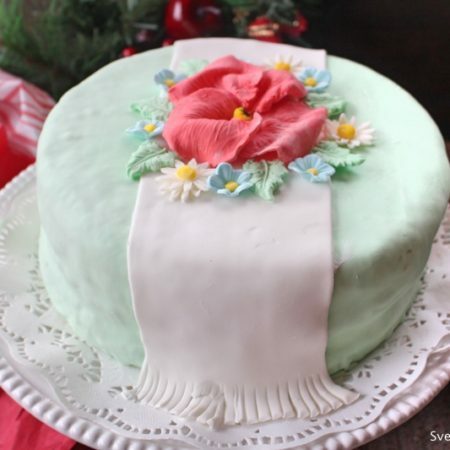 This cake is one of many delicious, Ukrainian cake's that I make for many occasions. I fell in love with this recipe after the first time that I tried making it. It's very easy to make and it is beyond delicious. Try it out and I hope you like it as much as I do. 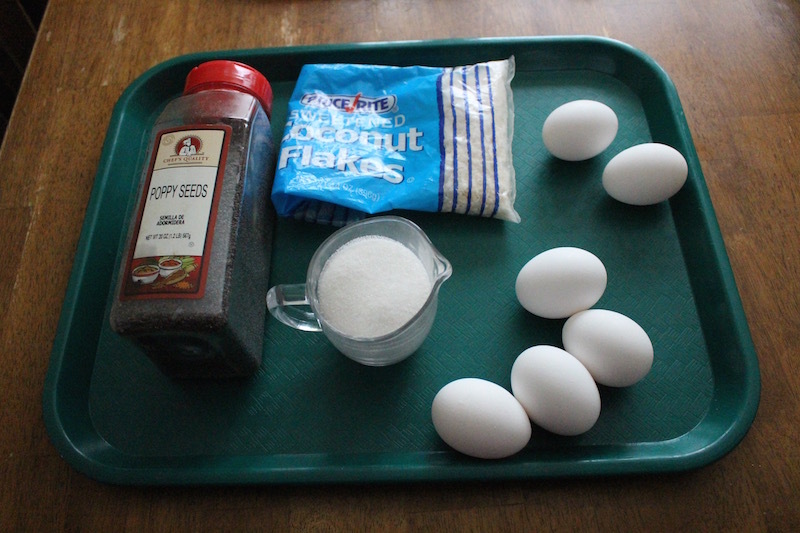 Then add poppy seeds, coconut flakes and 2 tablespoons of flour into the egg whites mixture and mix with a spatula. Let it bake for 30 min at 250 F then lower the temp to 200 F and bake for additional 3 hours. The first two layers of the cake are baked and should be cooling down at this point. In a medium size bowl mix by hand egg yolks with sugar and place on top of the pot (full of boiling water) to bring this mixture to boiling point.Then let it cool down. In another pot add milk/ flour and bring to a boiling point and then let it cool down. 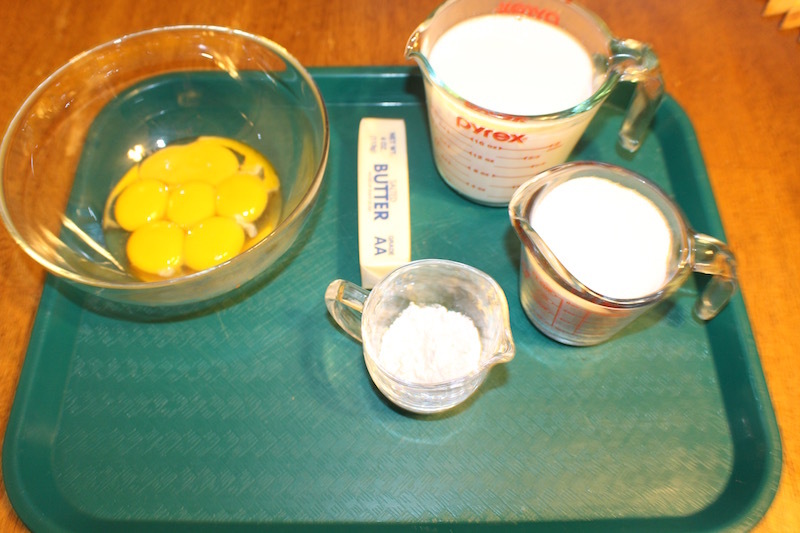 Add the two mixtures into a mixer with room temperature butter and mix for about 5 minutes. Take the first layer of the cake and cover the top with this cream. Then take the meringue layer and cover the bottom and the top with chocolate. Then add the top layer for the cake and cover it with the cake cream and let it dry a little before covering it again with a chocolate layer and covering the sides of the cake with chocolate.